Let’s face it; shopping online is never easy. You want to know you’re shopping with the best (and only the best). That is why we have devised a list of the Top 5 Gift Basket Vendors so you can take the guesswork out of finding the right company. Our editors handpicked this list of the Top 5 based on their pricing, selection, customizability and of course, their guarantees. When you shop with any one of these five, you can shop with peace of mind. We’ve all been there. You have that one relative on the list that you forgot – and now you have to scramble to get a gift. Perhaps a special occasion has come up and you want to ship out something special as soon as possible. This list of the Best Last Minute Shopping Gift Baskets was created for the procrastinators, last-minute shoppers and “oops” moments we all have. Sometimes you just don’t want to send an edible gift basket – or the occasion just doesn’t scream “eat me!” We get that. This is exactly why we have selected vendors for our Best Non-Edible Gift Baskets list. They feature things like gifts for the fur babies (because they matter too), spa gifts and even housewarming gifts that are shelf-stable – so your recipient can enjoy them whenever is convenient for them. Perhaps you’re shopping for more than one gift basket or you just want a go-to vendor for all of your gift basket needs. This list of the Best Variety Gift Baskets specifically focuses on vendors with vast inventories, tons of selections and even add-on items that give your gift that extra pizazz. You could just say they are your one-stop-shop. Whether you are giving a gift to a foodie, client or you just want something more than the usual, these Best Gourmet Gift Basket vendors focus on the fine food products, charcuterie, wines and more. Some dabble in secret recipe chocolates, others focus on meats and cheeses. No matter which you choose, you can rest assured the recipient of this basket will be impressed (and full). There’s nothing wrong with shopping on a budget – we all do it. 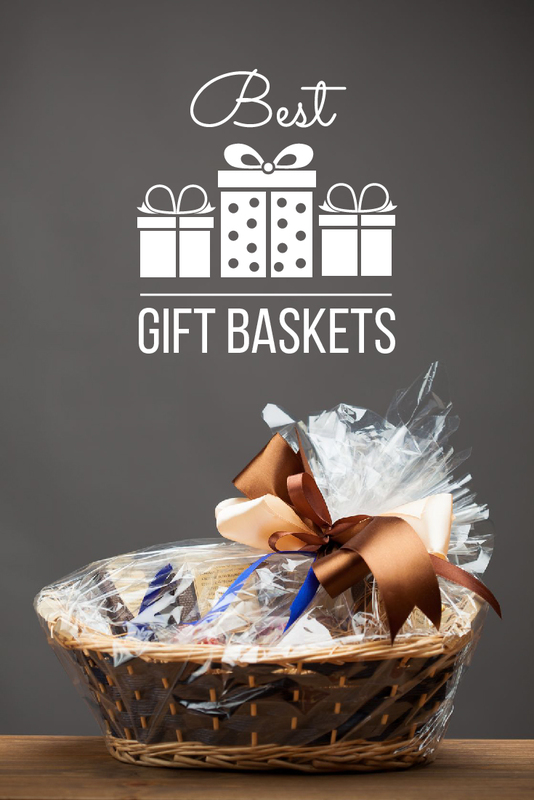 For you, we have selected a list of the Best Affordable Gift Baskets. These merchants aren’t just cheap in price, they have great shipping rates and tons of selections under $50 – so that you can truly shop on a budget. The “standard” isn’t for you or your recipient. You need to create your own. We get that. That is why we have found a list of the Best Places to Design Your Own Gift Basket. Get your creative on and impress your recipient by designing your very own gourmet gift basket online today! Some people have special dietary restrictions and it’s not a fad; it’s a way of life for them. For these recipients (or even if shopping for yourself), you need vendors that offer sugar-free, gluten-free, vegan and even organic products. That is why we have curated a list of the Best Specialty Gift Baskets so you can gift delicious eats without harming anyone’s health or dietary concerns. Not all vendors offer wines and those that do may include sample size bottles or worse, don’t take the quality of the wine or liquor very seriously. To make sure you get that top-notch wine, excellent microbrew and even a delicious selection of margarita mixes, we’ve concocted a list of the Best Gift Baskets for Wine and Liquors. To truly impress your newest client or thank an employee for their service, you want a gift basket that is delicious, but also reminiscent of your brand. For you, we have the list of the Best Gift Baskets for Corporate Giving. These companies offer corporate discounts, personalization opportunities and more – so you can use them as a valuable marketing tool. Sometimes you need to take the guesswork out of finding the right basket and pick something that suits the holiday. While most merchants will offer a holiday-themed basket, these are the Best Holiday Themed Gift Baskets money can buy – and they go the extra mile to make the occasion extra special. Not sure what kind of gift basket to give? Well how about getting the best choices based on the kind of buyer you are? You are the do-it-yourself type. Only this time around you don’t have time to hunt for the basket and all the items. So, you want a company that offers a create-your-own basket feature so you can design a basket on their time and take the credit for your gifting savviness. You’re hunting for the perfect basket, but you have a max budget. For you, you need a group of vendors that are budget-friendly in price, offer excellent quality and don’t make the budget bulge after shipping and taxes are added on. For you, price isn’t the issue. Instead, you need something that is ready to impress. These gift basket merchants know how to do just that – and they’ve curated their own list of striking baskets just for you. The prices of gift baskets can vary great – from $30 to as much as $800. Pick a price point you want to stay under and that will help you narrow down the choices. Not all gift basket vendors have baskets for every sentiment and occasion. If you have a specific gift need (such as a new baby or housewarming), you can narrow down the list by companies that offer those themed baskets. Do you want it to be off-the-shelf or unique? Some companies don’t let you add-on to the basket or customize it and others will let you create your very own. You need to decide how much interaction you want in the actual design process before you pick a basket. How fast do you need it? Some vendors take up to three weeks to deliver, while others can deliver same day. Your delivery timeline will help you decide which company can meet the deadline.